13/16" under lip aluminum counter top edging. Stocked in a satin anodized and a silver luster finish in 12 ft. and 6 ft. lengths (NO HOLES). 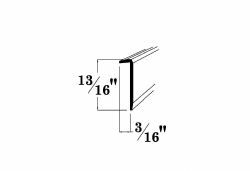 13/16" under lip aluminum counter edge available in 12' and 6' lengths in a satin anodized and a silver luster finish.